this picture describes Saturday’s competition, completely. Caring, support and friendship was felt by all! 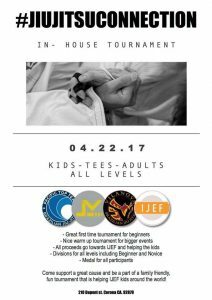 On Saturday, April 22nd 2017 the first ever IJEF Benefit Tournament was held at Pacific Top Team, Corona hosted by Jiu Jitsu Connection and many supportive academies in Southern California. Almost 100 competitors came together to compete in this milestone of an event. 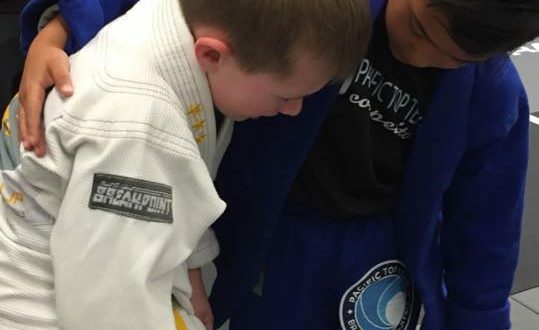 There were kids of all ages and adults as well competing for a great cause in an effort to support children in South America and around the world to help provide uniforms and Jiu Jitsu to these impoverished communities. Several academies participated including Vilanova Brazilian Jiu Jitsu Camarillo, Level Up Brazilian Jiu Jitsu West Los Angeles, Inner Strength Martial Arts Santa Maria, All American Jiu Jitsu Academy, and others. Jiu Jitsu Connection is a movement of friendly schools getting together to promote Jiu Jitsu, friendship, and helping others in a positive environment and for positive causes such as supporting the International Jiu Jitsu Education Fund. We’d like to thank everyone for participating and we appreciate you so much! Your support means everything!! ?? We’re happy to announce that IJEF’s Brazil Project is now teaching jiu-jitsu to a total of 32 children absolutely FREE. Coach Felipe, based in São Paulo, Brazil, and sponsored by Level Up BJJ in West Los Angeles, has been putting in some serious effort to recruit and train as many kids as he can — it’s clear his hard work is paying off! Way to go Coach Felipe, and keep up the fantastic work!